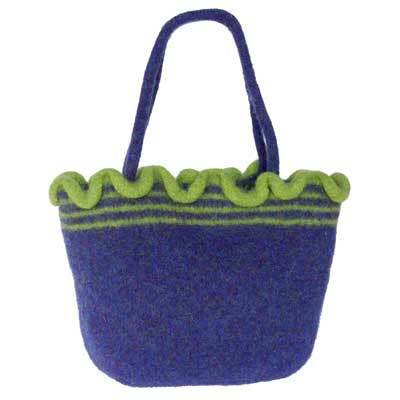 Our stunning Ripple bag kit is knitted with two contrasting dyed wools. The stripes and ripple edging at the top are a striking feature. The bag is fastened with a magnetic clasp. The handles are handbag length, but there will be enough wool if you prefer shoulder bag length handles. The finished size of the example containing hand-dyed wool is approximately 27 cm x 27 cm x 12 cm (width x height x depth) depending on how far you take the felting process.